Illustration. Presentation Design. Information Visualization. Visual process documents created for the Connections Education (CE) Multimedia Standards & Design (MS&D), and Curriculum departments. These documents were intended for use by clients, new employees and contractors. The purpose of these process diagrams was to simplify the detailed written process, visually communicate the various steps and parties involved, identify the places where reviews and approvals needed to take place, and set expectations for timeline. An example of one of the process documents I outlined, designed and illustrated for MS&D. 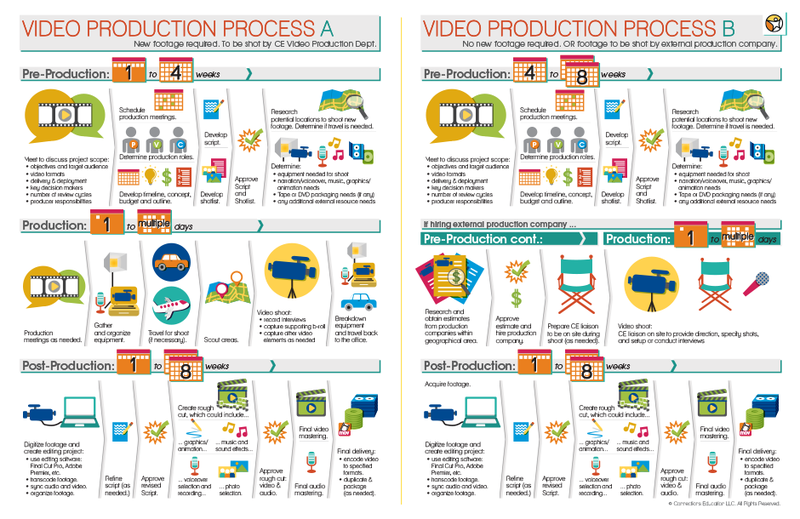 Originally, Rachel was approached to create a one off process diagram for the AV Department: a Video Production Process to be distributed to clients (curriculum team employees) who were having trouble understanding why the process took as long as it did. Rachel was asked to design something that was playful and would speak to educators. 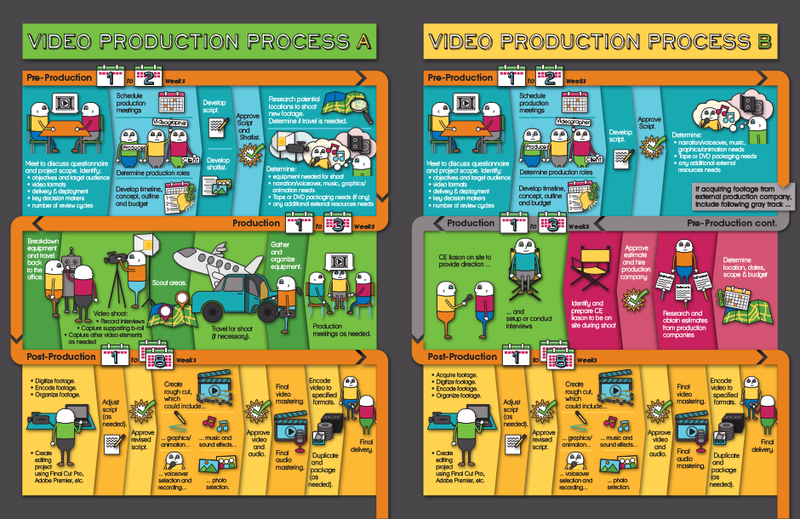 The original design for the Video Production Process. After reviewing the initial design, it was determined that it might be nice to have visualizations for all of the MS&D processes (and later extended to Curriculum processes). Rachel was asked to design a more generic and corporate style that could apply to a library of process documents; it needed a defined color palette, font, header style and icon style that could be repeatable for all processes. The redesigned Video Production Process establishing the look and feel for all future process documents. CE provides virtual education solutions for students in K-12. The MS&D team is responsible for producing interactive tutorials and tools designed to engage students and support online learning. MS&D is also responsible for creating all employee, student and parent trainings. © 2016 Rachel Gozhansky. Site design based on theme by GraphBerry.